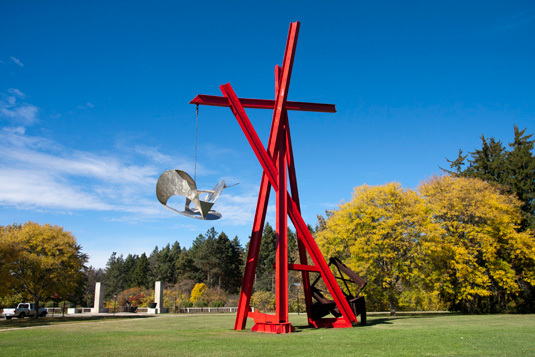 Ever wonder who designed the large red sculpture on the Museum grounds? Or what inspired the signature Orpheus Fountain? Take a self-guided outdoor sculpture tour, highlighting 12 historic and contemporary favorites. Maps are free with regular Museum admission and are available at the Front Desk. Delve a little deeper and try our self-guided outdoor sculpture treasure hunt. Designed for adults and children, visitors will search for up to 18 sculptures on the grounds. Discover fun facts about the artists and investigate related works. Sign out a set of “outdoor sculpture cards” at the Museum Front Desk and begin your exploration. Cards require a $20 deposit, which is fully refunded when the cards are returned to the Museum Front Desk.